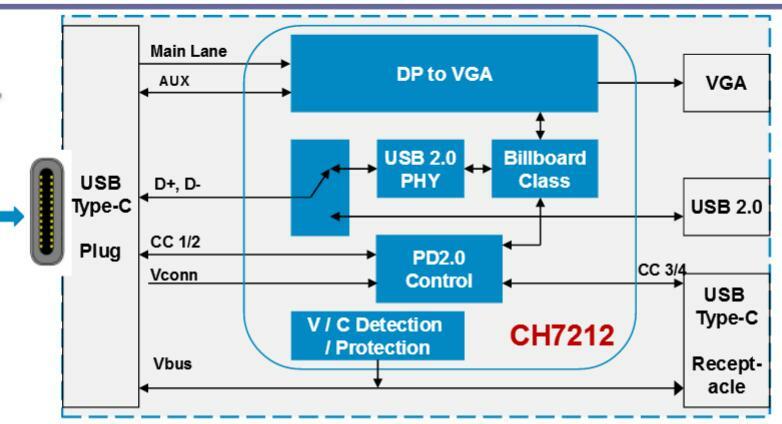 Chrontel’s CH7212 is a low-cost, low-power semiconductor device that translates the DisplayPort signal to VGA through the USB Type-C connector. This innovative USB Type-C based DisplayPort receiver with an integrated VGA Transmitter is specially designed to target the USB Type-C to VGA converter, adopter and docking device. Through the CH7212’s advanced decoding / encoding algorithm, the input DisplayPort high-speed serialized multimedia data can be seamlessly converted to VGA output. The CH7212 is compliant with the DisplayPort specification version 1.3 and the Embedded DisplayPort Specification version 1.4. In the device’s receiver block, which supports two DisplayPort Main Link Lanes input with data rate running at 1.62Gb/s, 2.7Gb/s or 5.4Gb/s, can accept RGB digital formats in either 18-bit 6:6:6 or 24-bit 8:8:8, and converted the input signal to VGA output up to 2048x1536@60Hz with reduced blanking. Leveraging the DisplayPort’s unique source/sink “Link Training” routine, the CH7212 is capable of instantly bring up the video display to the VGA monitor when the initialization process is completed between CH7212 and the graphic chip. The DACs are based on current source architecture. And the VGA output meet VESA VSIS v1r2 clock jitter target. With sophisticated MCU and the on-chip Flash, CH7212 support auto-boot and EDID buffer. After the configuration by firmware, which is auto loaded from the Flash embedded, CH7212 supports DisplayPort input detection, DAC connection detection and determine to enter into power saving mode automatically.